Wednesday night was the busiest night at the izakaya. I must have been really exhausted when I got home around midnight… Next morning I woke up feeling awfully heavy. When I was getting dressed around noon to go to work, I found my jacket hanging in the closet instead of the place where I always hang it, and I had absolutely no memory of hanging it in the closet after coming back from work that night. I’m leaving for my parents’ house early Saturday morning. They are calling for rain on the New Year’s Day. Gee, when was the last time we had a rainy New Year’s Day ...? I truly want to thank you all for supporting my humble blogs this year. May your new year be better than ever. When I wake up in the morning, the first thing I do is to grab a remote and turn on the TV. I watch TV morning show for about 30 minutes in bed, asking myself a permission to stay in bed for“5 more minutes”again and again. 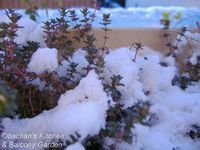 This morning, the first news I saw was about the snowfall in this area (again! ), so I got out of bed right away and opened the curtain. Yes, it snowed! I was thinking about getting some straw from somewhere to keep my blueberry plant warm, but I guess I waited too long (as usual…). I need to work in the afternoon today and hope the snow on the street would completely melt by then. Otherwise my bicycle might slip on the melting snow… :( Good thing is that I don’t have to work tonight. I can do a major shopping on my way back from work this afternoon, and work on cleaning my room for the rest of the day. I’ve decided to “have a Christmas dinner in a tidy room” this year, so cleaning would keep me quite busy tonight. Last weekend I visited my parents’ house and picked oranges in my dad’s orchard with my parents. 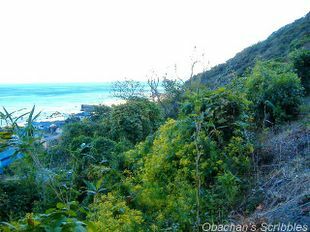 In my hometown, oranges are grown on the mountain slope close to the ocean. 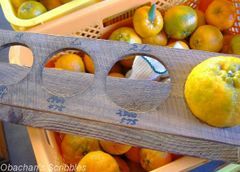 It is our privilege to enjoy the nice view of the ocean as we pick oranges in the orchard. 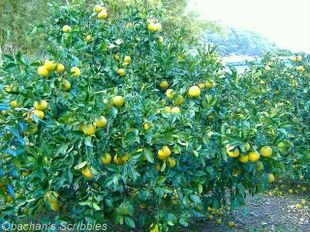 Ponkan (Citrus reticulata blanco) orange trees. 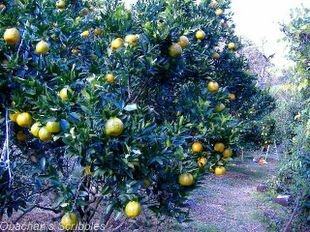 Buntan (Citrus grandis) orange trees. 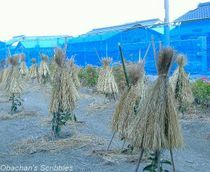 We are not picking buntan until January or later. We picked ponkan oranges all afternoon and dad brought them down to the storage house. 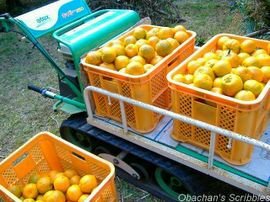 On Sunday morning, we sorted the ponkan oranges according to size. To sort them into S, M, L, 2L and 3L size groups, we used the wood plate with different-sized holes, which has been handed down from my grandpa's generation. I heard that it snowed a lot in Kochi city that weekend, but this is how the ocean and the sky looked on Sunday in Muroto. 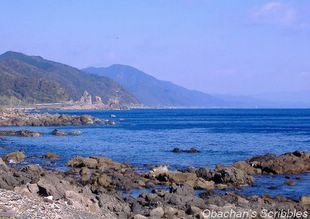 The big rocks near the mountain are called myoto-iwa (wedded rocks). Tonight I was going through my old stuff I brought back from Osaka when I moved to Kochi in 2000. I couldn’t find what I was looking for, but instead, I found this photo. 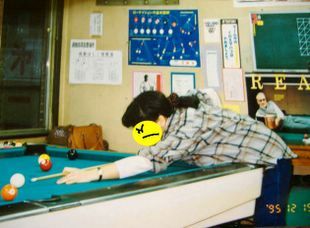 This is me ten years ago, shooting pool. Yeah, my hair was longer then. I really loved the Paul Newman poster on the wall, but this pool hall closed after I came back to Kochi, and I don’t know what happened to the poster. 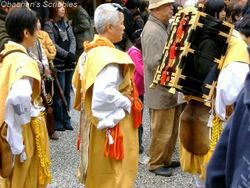 Ever since I started this blog more than a year ago, I have been enjoying re-discovering the value of our local customs. 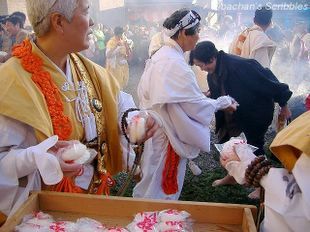 Attending traditional events are fun, eye-opening, enchanting, intellectually stimulating and sometimes healing… But I never knew that observing a traditional ceremony can be that physically challenging. 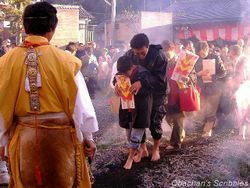 :D Last Sunday, I went to a temple to see a big bonfire ceremony, and it was a real unforgettable experience. What did I climb up the hill that much for ??? Anyway, at the temple, the ceremony was about to start. 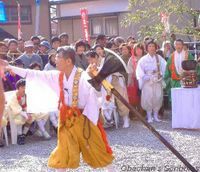 According to the newsletter article, this event was a sort of collaboration of Shinto and Buddhism rituals aiming at getting rid of troubles/ worries, and welcoming good luck, health and family safety. 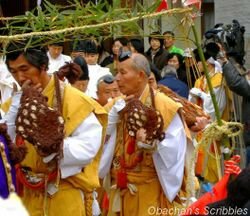 Many of you might find this strange, but the fact is that in Japan, the two religions -- Shinto and Buddhism -- uniquely co-exist. 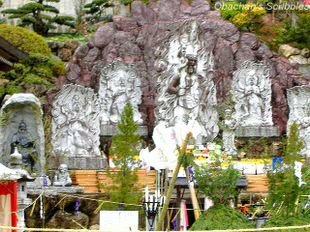 At the temple, branches of Japanese cypress were piled up in the center of a square, roped-off area near many Buddhist statues. 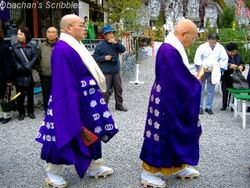 After a while, Buddhist monks in colorful costumes, yamabushi (mountain priests?) 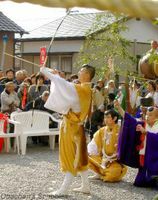 with conch-shell horns and Shinto priests came into the square. There were kid priests, too. Then a dialogue took place between the host mountain priest and mountain priests from a distant prefecture, waiting outside the square. The host asked the leader of the visitors questions to test their religious knowledge, and they were allowed into the square after the leader answered all the questions. It was a chilly, cloudy day and it finally started raining in the middle of the ceremony!! Of course the ceremony went on and we had to use umbrellas or rain coats. Many of the attendants were elder people and I was worried that they might catch a cold. 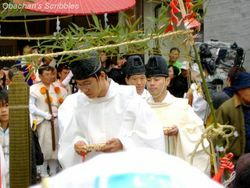 Some rituals were performed to chase the evils away and purify the area. After a guy showed a performance with chained sickles, four guys cut rolled rush mats facing four directions. That was supposed to slay the evils in north, south, east and west. The arrow and the ax were also supposed to kill the evils and purify the area. 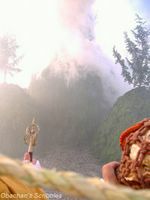 Finally, they started burning the cypress branches!! 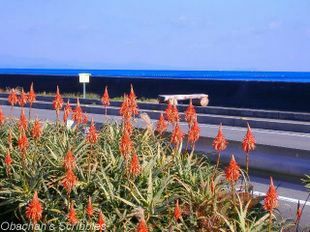 Then the cypress branches started burning with a big flame! 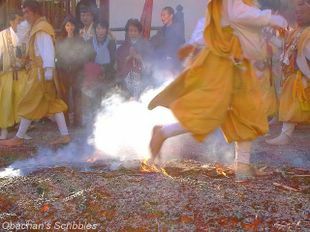 Now we got so hot, even with the mountain priests standing in front of us throwing flat, long wood pieces into the fire. 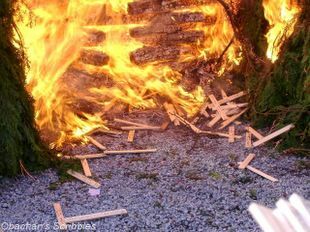 I assume those wood pieces had the visitors’ wishes written on, and they were burned so that the wishes would go up in the air with the smoke to reach someone above in heaven. This fire is also supposed to burn our worries and negative feelings such as jealous, greed and hatred. This reminded me of the "sweat lodge ceremony" that I attended when I was in Arizona more than 10 years ago. IIRC, they encouraged participants to take out the negative feelings onto the fire (or was it heated rocks or something?) burning in the shallow pit in the ground inside the sweat lodge. 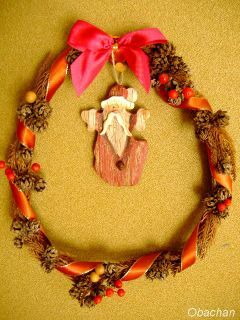 They said that the ancestors would come to the fire and take care of the negative feelings. As the fire got smaller, the priests flattened the charcoals and ashes which were still hot. Now it was time for the “fire walking ritual.” I’ve seen mountain priests walking on fire like this on TV before, so I knew it was part of their training. 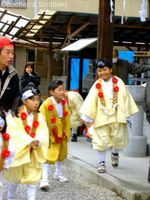 Then to my surprise, I heard an announcement, “Those who want to participate in the fire-walking, please buy a gohei (paper ornament for Shinto ritual) and hold it in your hands.” What?! Do the visitors also walk on the hot charcoals in bear feet? You mean these grandmas and grandpas? I thought they would place something over the hot ashes for the regular people to walk on.